Developing a healthy private economy under the market mechanism is an objective, imperative and long-term requirement in the process of improving institutions for and developing the socialist-oriented market economy; is an important method to release production forces and effectively mobilize, distribute and utilize resources for development. The private economy is an important driving force for economic development. The state economy, the collective economy along with the private economy are the core for developing an independent and sovereign economy. To encourage and create favorable conditions for the private economy to develop in a rapid, sustainable and diversified manner, recording a high growth rate in quantity, size, quality and contributions to GDP. To abolish all barriers and prejudices and create every favorable condition for the private economy to develop in a healthy manner and in the right direction. To bring into play the private economy’s positive aspects beneficial to the country at the same time with intensifying examination, inspection, supervision and control, ensuring publicity and transparency and precluding and restricting its negative aspects, especially preventing and combating all manifestations of “crony capitalism”, “group interest” relations, policy manipulation and unfair competition for gaining illicit profits. The private economy will be developed in all sectors and fields that are not prohibited by law. To promote startup, innovation and creativity movements; to raise the operational effectiveness of small- and medium-sized enterprises. To create a favorable environment and conditions for business households to voluntarily associate into cooperative entities or operate after the enterprise model. To encourage the formation of multi-owner private economic groups and individuals to contribute capital to state economic groups which are capable of joining regional and global production networks and value chains. To encourage the private economy to contribute capital to or purchase shares of state enterprises upon equitization and state capital withdrawal. To promote the development of all forms of linkage in goods production and trading and service provision between the private economy and the state economy, collective economy and foreign-invested enterprises in order to acquire, transfer and widely spread state-of-the-art technologies and modern governance skills, increase added value and expand outlet markets. To pay attention to training, education and heightening of political awareness, the spirit of self-reliance, patriotism and national pride, and attachment to the country’s interests and the cause of socialist construction for enterprise owners. To develop a strong contingent of Vietnamese entrepreneurs who have a sense of law observance, social responsibility and high leadership and management capabilities; to attach importance to building a corporate culture and business ethics. To develop a healthy, effective and sustainable private economy to truly become an important driving force of the socialist-oriented market economy, contributing to achieving fast and sustainable socio-economic development, increasingly improving the people’s living standards, realizing social progress and justice, ensuring national defense and security, and early turning Vietnam into a modern industrial country. To attach importance to raising the business quality and efficiency in the private economic sector. To strive to have at least 1 million enterprises by 2020, over 1.5 million enterprises by 2025, and at least 2 million enterprises by 2030. The growth rate of the private economy will be higher than that of the national economy. To strive to increase the private economic sector’s contributions to GDP to about 50 percent by 2020, 55 percent by 2025, and 60-65 percent by 2030. To raise the labor productivity in the 2016-25 period by 4-5 percent/year. 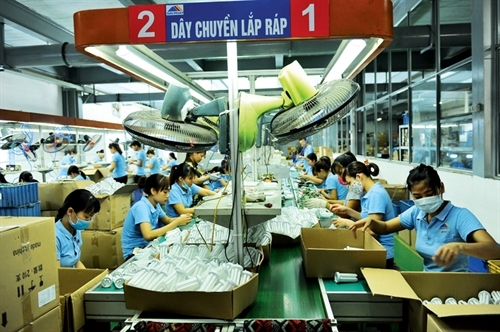 To narrow the gap in terms of technological level, workforce quality and competitiveness between private enterprises of Vietnam and the top four ASEAN member states; many private enterprises will participate in regional and global production networks and value chains. To create a high consensus in the society about encouraging and facilitating the development of the private economy. To bring into play the private economy’s advantages and huge potential in socio-economic development along with effectively overcoming negative practices arising in the course of development of the private economy. To effectively prevent and combat manifestations of degradation in political ideology, morality and lifestyle as well as of “self-evolution” and “self-transformation” in the formulation and implementation of the Party’s guidelines and the State’s policies and laws on development of the private economy. To synchronously implement solutions to stabilize the macro-economy, control inflation and push ahead economic restructuring in association with growth model renewal. To proactively and flexibly administer monetary policy under the market mechanism and control inflation at a rational rate. To synchronously and effectively combine monetary and fiscal policies and other macroeconomic policies. To ensure stable interest rates and exchange rates suitable to macroeconomic conditions and the market. To step up the restructuring of credit institutions in tandem with handling non-performing loans; to restructure the state budget along with reducing the state budget deficit, ensuring safety of public debts and increasing efficiency of public investment; to encourage investment by the private sector. To fully institutionalize and strictly guarantee the right to freedom of enterprise, property ownership as well as civil rights and obligations of organizations and individuals in accordance with law. To introduce incentives for the formation of private enterprises; to narrow conditional business fields, and create conditions for the private economy to invest in and develop production and business in the trades, sectors and geographical areas that are not prohibited by law and in conformity with the socio-economic development strategy in each period. To encourage and create conditions for business households to expand their business, improve operation efficiency and voluntarily associate into various forms of cooperative entities or switch to operate after the enterprise model through such policies as reducing and exempting corporate income tax and land use levy in the initial years of operation; giving advice and instructions on enterprise establishment formalities, production and business planning and organization of financial and accounting work; providing information and guidance on business governance and legal counseling. To improve and transparently and effectively implement policies in support of development of small- and medium-sized enterprises, startup, innovation and creativity movements; to create pre-conditions for the formation of private economic groups under mixed ownership, including making financial contributions to strong state economic groups capable of competing and participating in regional and global production networks and value chains, especially in the fields of processing, manufacturing and electronics industries and agriculture. To adopt policies to stimulate agricultural production mainly based on large and hi-tech enterprises, cooperatives and farms. To attach importance to developing agriculture-supporting industries and services. To increase and improve vocational training for farmers. To ensure that all incentives and supports for the development of the private economy conform with the market mechanism and foster the autonomy and competitiveness of the private economy; to refrain from turning mechanisms and policies in support of developing the private economy into subsidies serving “group interests.” To refrain from turning approvals and certifications of eligibility into sub-licenses, creating barriers to private economic activities. To improve and strictly and effectively implement regulations on contract. To enhance the capacity, effectiveness, efficiency of institutions of settlement of economic or civil disputes, focusing on negotiation, conciliation, commercial arbitration activities and the court system, to protect the lawful rights and interests of people and enterprises. To strongly and synchronously develop all types of market and goods and service distribution networks nationwide, especially the market of production materials; to concurrently take measures to effectively safeguard the domestic market in association with developing foreign markets under international commitments. To ensure fair competition in the market. To properly plan the distribution networks suitable to local population size and characteristics. To develop production in tandem with domestic demand and the expansion rate of foreign markets. To adopt effective measures to stabilize consumption markets, especially for farm products. To better combat trade fraud, market manipulation and price distortion. To remove all administrative barriers, policies and measures directly intervening in the market and production and business, causing unequal access to social resources, particularly capital and land, and business opportunities, which affect the private economy’s competitiveness. To enhance transparency and control business monopoly, ensuring fair competition in the market. To develop policies to facilitate the private economy’s involvement in the restructuring of state enterprises through capital contribution or share purchase; to promote the connection in value chains between state and private enterprises. To speed up socialization of public services. To prioritize attraction of foreign direct investment in hi-tech investment projects between large multinational corporations and domestic private enterprises, especially in processing, manufacturing, supporting industries and hi-tech agriculture. To improve regulations on finance management and transparency of financial information of private enterprises. To concentrate efforts on developing a comprehensive and modern socio-economic infrastructure system, particularly transport, energy, telecommunications, urban development, water supply and drainage, irrigation, waste treatment, and logistics services, and create favorable conditions for the private economy to equally access and use these facilities at a reasonable cost. To early complete regulations to boost public-private partnerships in the investment and commercial operation of economic-technical infrastructure projects and works. To strictly control investment cost, operation and capital recovery of infrastructure projects so as to reduce production and business costs for people and enterprises. To better satisfy enterprises’ demand for multimodal transportation based on a synchronous transport system that links major economic hubs and transport axes. To expand investment in and modernize road, rail, maritime, inland waterway and air transport; to increase the connection between regional and local transport systems and between domestic and international transport systems; to develop convenient logistics and distribution services meeting the demands of domestic and international markets. To improve the planning and increase investment in the synchronous development of industrial parks, industrial clusters, export-processing zones and hi-tech parks, fully meeting enterprises’ needs for production and business grounds with adequate infrastructure facilities and services at a reasonable cost. To expeditiously improve laws on land, natural resources and environment, creating favorable conditions for the private economy to access land and resources markets in a transparent and equal manner under the market mechanism. To revise relevant provisions so that land use rights will truly become an asset that can be transferred, traded or mortgaged for civil and economic obligations, and that organizations and individuals may lease and be allocated land for a long term and with areas suitable to their production and business needs. To restructure and promptly, securely and effectively develop financial markets, especially monetary and capital markets; to create equal and favorable conditions for the private economy to access bank loans and raise capital on the securities market, particularly through the issuance of corporate bonds and use of financial services at a reasonable cost. To diversely develop financial institutions, venture investment funds, credit guarantee funds, microfinance institutions, and financial consultancy, accounting, auditing, price evaluation and credit rating institutions. To vigorously restructure and synchronously develop the securities market, develop the corporate-bond market and derivatives markets so that the securities market will truly become an important channel for private enterprises to raise medium- and long-term capital. To develop safe and sound credit institutions; to protect the lawful interests of depositors, customers and credit institutions. To develop diverse banking services of higher quality, particularly credit and payment services. To study and adopt credit mechanisms and policies suitable to different production and business methods and customers. To develop various insurance products and services of higher quality. To attach importance to the development of agricultural insurance. To create mechanisms and policies for the private economy to actively participate in international economic integration. To assist the private economy in accessing and seizing opportunities in international integration; to remove irrational barriers to the private economy when participating in international trade and investment. To create conditions for the private economy to enhance capacity to deeply and firmly participate in regional and global value chains. To encourage and support the private economy to invest in research and development activities, and application and transfer of advanced technology. To improve and ensure effective enforcement of the law on intellectual property. To develop technology innovation and application funds. To introduce tax, financial support and capital access policies suitable to technology research, innovation and modernization activities. To connect startup enterprises and innovation ideas with investors and investment funds. To prioritize the development of hi-tech parks, hi-tech incubators and technology and science enterprises. To boost the investment in and development of technological and scientific research institutions and scientists. To increase domestic and international cooperation in scientific and technological research, development and application; to sell, purchase and transfer new scientific and technological products. To further commercialize products of scientific and technological research. To vigorously implement the national strategy on human resource development. To fundamentally and comprehensively reform education and training activities and improve their quality, particularly vocational training and training of high-quality human resources to satisfy the development needs of the private economy. To increase cooperation and connection between enterprises and training institutions; to plan and develop training in response to the demands of businesses and the market. To continue developing the contingent and promoting the role of Vietnamese entrepreneurs in the period of accelerated industrialization, modernization and international integration. To attach importance to training and development of entrepreneurs who have high professional skills, modern management skills, business ethics and a sense of responsibility toward the nation. To build and widely apply ethical and cultural standards of Vietnamese entrepreneurs in the socialist-oriented market economy.